The Normandy landings took place on Tuesday 6 June 1944 forever to be known as D-Day. 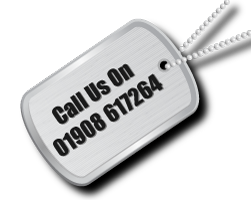 The landings code name was ‘Operation Neptune’ and was part of the Allied invasion of Normandy whose code name in turn was ‘Operation Overlord’. This was the largest seaborne invasion in history and its sole aim was the liberation of German-occupied north western Europe from Nazi control and consequently Allied victory on the Western Front which would hopefully bring about the end of the war with the aid of the Russian forces on the Eastern Front. Planning began for this operation in 1943. In the months leading up to the invasion, the Allies conducted a substantial military deception which was codenamed ‘Operation Bodyguard’. This was to mislead the Germans as to the date and location of the main Allied landings. The weather on D-Day was not ideal. However postponing would have meant a minimum delay of at least two weeks, as the invasion planners had requirements for the phase of the moon, the tides, and the time of day. This meant that only a few days in each month were deemed suitable. In command of the German forces, and in developing the formidable fortifications of the Atlantic Wall, were Field Marshal Erwin Rommel. The amphibious landings were preceded by extensive aerial and naval bombardment as well as an airborne assault. 24,000 American, British, and Canadian airborne troops landed shortly after midnight. There job was to protect the flanks and stop German troops from reinforcing the beach defences. Allied infantry and armoured divisions began landing on the 50 mile (80km) stretch of Normandy coastline at 06:30. Earlier a company from the Ox and Bucks, commanded by Major John Howard, were tasked with capturing the bridges over the Caen Canal and the Orne River. This they did in a coup de main operation landing in Gliders right by the bridge. Here the first British Soldier was killed (Lt H D Brotheridge). 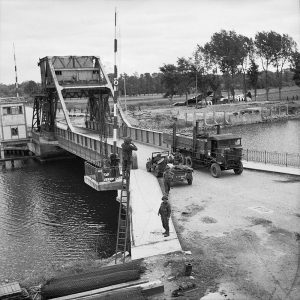 After its capture the bridge was called ‘Pegasus Bridge’ after the emblem worn by its liberators. Also not far from here the 9th Parachute Battalion commanded by Lt Col Terrence Ottway landed and took the Merville Battery, thus stopping shells from her four cannon firing on Sword Beach. 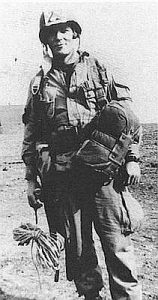 American Parachutist from the 101st and 82nd Divisions landed on the Cottintan Peninsula. The 82nd were tasked with the capture of bridges across the Merderet River and the town of Sainte-Mere-Eglise. F Company landed directly on the town and was massacred as they landed. 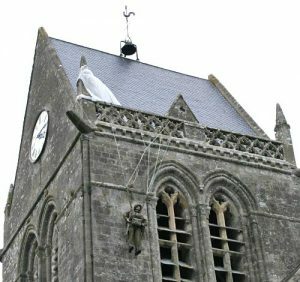 Private John Steele’s parachute got caught on the church steeple (today’s monument pictured left). He hung there feigning death until he was cut down by Germans later. At Brecourt Manor, a composite company commanded by Lt Richard Winters (pictured right) took out the guns that were firing down Causeway Two onto Utah Beach. Winters went on to lead Easy Company throughout the Normandy campaign and into Holland and Bastogne. 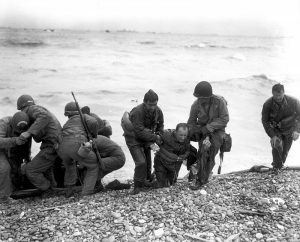 The Normandy coast was divided into five sectors: Utah, Omaha, Gold, Juno, and Sword Beach. The men landed under heavy fire from gun emplacements overlooking the beaches, and the shore was heavily mined and covered with obstacles such as wooden stakes, metal tripods, and barbed wire, making the work of the beach-clearing team’s task difficult and dangerous. At Gold, Juno, and Sword, several fortified towns were cleared in house-to-house fighting, and two were disabled using specialised tanks known as ‘Hobart’s Funnies’ named after their creator Major General Percy Hobart. The American forces would not use these unique devices but used a number of DD (Duplex Drive) Swimming tanks. Strong winds blew the landing craft east of their intended landed positions particularly at Utah. However, the new landing position for the 4th Infantry Division proved easier than their original spot. They were led ashore by Brigadier General Theodore Roosevelt. For his actions that day he was awarded the Congressional Medal of Honour. 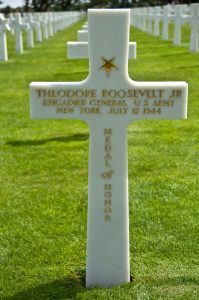 He died 12 days later of a heart attack and is buried in the American Cemetery above Omaha Beach. Casualties were heaviest at Omaha and the first wave was practically wiped out. The bombardment did not do its job and dropped the shells too far inland as did a bombing run by a number of Marauder aircraft. German Machine gunners waited for the troops to leave the landing crafts and cut them to pieces. Eventually Brigadier General Norman ‘Dutch’ Cota of the 29th Division came ashore with Lt Col Canham and began to make order out of the chaos. Slowly small groups of men made their way up the bluffs and eventually Cota led men down the Verville Draw. Later that afternoon the seawall was blown and finally the Americans were off of the beach. The commander of the 1st Division (‘The Big Red One’) lead his men off of the beach with the rallying cry ‘only two kinds of men will stay on this beach, those already dead and those about to die’. The Allies failed to achieve any of their first day goals. Carentan, St. Lô, and Bayeux remained in German hands, and Caen, a major objective, wasn’t captured until 21 July. Only two of the beaches, Juno and Gold, were linked on the first day, and all five beachheads were not connected until 12 June; however, the operation gained a foothold which the Allies gradually expanded over the coming months. German casualties on D-Day were around 1,000 men. 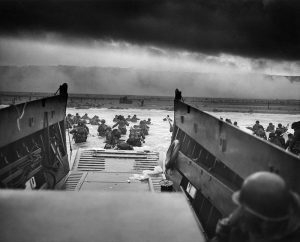 Allied casualties were at least 10,000, with 4,414 confirmed dead.